"Floppy" redirects here. For other uses, see Floppy (disambiguation). A floppy disk, also known as a floppy, diskette, or simply disk, is a type of disk storage composed of a disk of thin and flexible magnetic storage medium, sealed in a rectangular plastic enclosure lined with fabric that removes dust particles. Floppy disks are read and written by a floppy disk drive (FDD). Floppy disks, initially as 8-inch (203 mm) media and later in 5 1⁄4-inch (133 mm) and ​3 1⁄2 inch (90 mm) sizes, were a ubiquitous form of data storage and exchange from the mid-1970s into the first years of the 21st century. By 2006 computers were rarely manufactured with installed floppy disk drives; ​3 1⁄2-inch floppy disks can be used with an external USB floppy disk drive, but USB drives for ​5 1⁄4-inch, 8-inch, and non-standard diskettes are rare to non-existent. These formats are usually handled by older equipment. The prevalence of floppy disks in late-twentieth century culture was such that many electronic and software programs still use the floppy disks as save icons. 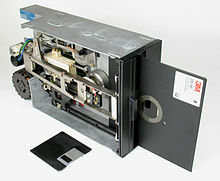 While floppy disk drives still have some limited uses, especially with legacy industrial computer equipment, they have been superseded by data storage methods with much greater capacity, such as USB flash drives, flash storage cards, portable external hard disk drives, optical discs, cloud storage and storage available through computer networks. The first commercial floppy disks, developed in the late 1960s, were 8 inches (200 mm) in diameter; they became commercially available in 1971 as a component of IBM products and then were sold separately beginning in 1972 by Memorex and others. These disks and associated drives were produced and improved upon by IBM and other companies such as Memorex, Shugart Associates, and Burroughs Corporation. The term "floppy disk" appeared in print as early as 1970, and although IBM announced its first media as the "Type 1 Diskette" in 1973, the industry continued to use the terms "floppy disk" or "floppy". In 1976, Shugart Associates introduced the ​5 1⁄4-inch FDD. By 1978 there were more than 10 manufacturers producing such FDDs. There were competing floppy disk formats, with hard- and soft-sector versions and encoding schemes such as FM, MFM, M2FM and GCR. The ​5 1⁄4-inch format displaced the 8-inch one for most applications, and the hard-sectored disk format disappeared. The most common capacity of the ​5 1⁄4-inch format in DOS-based PCs was 360 KB, for the DSDD (Double-Sided Double-Density) format using MFM encoding. In 1984 IBM introduced with its PC-AT model the 1.2 MB dual-sided ​5 1⁄4-inch floppy disk, but it never became very popular. IBM started using the 720 KB double-density ​3 1⁄2-inch microfloppy disk on its Convertible laptop computer in 1986 and the 1.44 MB high-density version with the PS/2 line in 1987. These disk drives could be added to older PC models. 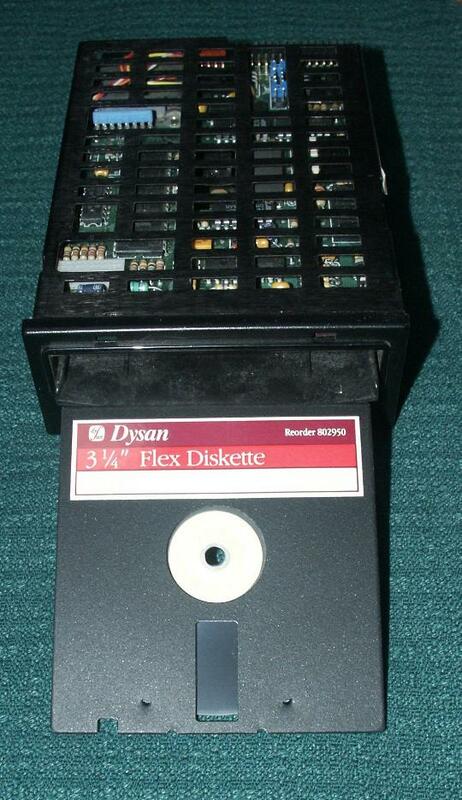 In 1988 IBM introduced a drive for 2.88 MB "DSED" (Double-Sided Extended-Density) diskettes in its top-of-the-line PS/2 models, but this was a commercial failure. Throughout the early 1980s, limitations of the ​5 1⁄4-inch format became clear. Originally designed to be more practical than the 8-inch format, it was itself too large; as the quality of recording media grew, data could be stored in a smaller area. A number of solutions were developed, with drives at 2-, ​2 1⁄2-, 3-, ​3 1⁄4-, ​3 1⁄2- and 4-inches (and Sony's 90.0 mm × 94.0 mm disk) offered by various companies. They all shared a number of advantages over the old format, including a rigid case with a sliding metal (or, later, sometimes plastic) shutter over the head slot, which helped protect the delicate magnetic medium from dust and damage, and a sliding write protection tab, which was far more convenient than the adhesive tabs used with earlier disks. The large market share of the well-established ​5 1⁄4-inch format made it difficult for these diverse mutually-incompatible new formats to gain significant market share. A variant on the Sony design, introduced in 1982 by a large number of manufacturers, was then rapidly adopted; by 1988 the ​3 1⁄2-inch was outselling the ​5 1⁄4-inch. Generally the term floppy disk persisted,[a] even though later style floppy disks have a rigid case around an internal floppy disk. By the end of the 1980s, ​5 1⁄4-inch disks had been superseded by ​3 1⁄2-inch disks. During this time, PCs frequently came equipped with drives of both sizes. By the mid-1990s, ​5 1⁄4-inch drives had virtually disappeared, as the ​3 1⁄2-inch disk became the predominant floppy disk. The advantages of the ​3 1⁄2-inch disk were its higher capacity, its smaller size, and its rigid case which provided better protection from dirt and other environmental risks. If a person touches the exposed disk surface of a ​5 1⁄4-inch disk through the drive hole, fingerprints may foul the disk—and later the disk drive head if the disk is subsequently loaded into a drive—and it is also easily possible to damage a disk of this type by folding or creasing it, usually rendering it at least partly unreadable. However, largely due to its simpler construction (with no metal parts) the ​5 1⁄4-inch disk unit price was lower throughout its history, usually in the range of a third to a half that of a ​3 1⁄2-inch disk. Floppy disks became commonplace during the 1980s and 1990s in their use with personal computers to distribute software, transfer data, and create backups. Before hard disks became affordable to the general population,[nb 1] floppy disks were often used to store a computer's operating system (OS). Most home computers from that period have an elementary OS and BASIC stored in ROM, with the option of loading a more advanced operating system from a floppy disk. By the early 1990s, the increasing software size meant large packages like Windows or Adobe Photoshop required a dozen disks or more. In 1996, there were an estimated five billion standard floppy disks in use. Then, distribution of larger packages was gradually replaced by CD-ROMs, DVDs and online distribution. An attempt to enhance the existing ​3 1⁄2-inch designs was the SuperDisk in the late 1990s, utilizing very narrow data tracks and a high precision head guidance mechanism with a capacity of 120 MB and backward-compatibility with standard ​3 1⁄2-inch floppies; a format war briefly occurred between SuperDisk and other high-density floppy-disk products, although ultimately recordable CDs/DVDs, solid-state flash storage, and eventually online storage would render all these removable disk formats obsolete. 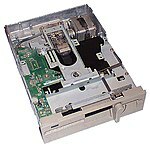 External USB-based floppy disk drives are still available, and many modern systems provide firmware support for booting from such drives. In the mid 1990s, mechanically incompatible higher-density floppy disks were introduced, like the Iomega Zip disk. Adoption was limited by the competition between proprietary formats and the need to buy expensive drives for computers where the disks would be used. In some cases, failure in market penetration was exacerbated by the release of higher-capacity versions of the drive and media being not backward-compatible with the original drives, dividing the users between new and old adopters. Consumers were wary of making costly investments into unproven and rapidly changing technologies, so none of the technologies became the established standard. Apple introduced the iMac in 1998 with a CD-ROM drive but no floppy drive; this made USB-connected floppy drives popular accessories, as the iMac came without any writable removable media device. Recordable CDs were touted as an alternative, because of the greater capacity, compatibility with existing CD-ROM drives, and—with the advent of re-writeable CDs and packet writing—a similar reusability as floppy disks. However, CD-R/RWs remained mostly an archival medium, not a medium for exchanging data or editing files on the medium itself, because there was no common standard for packet writing, which allowed for small updates. Other formats, such as Magneto-optical discs, had the flexibility of floppy disks combined with greater capacity but remained niche due to costs. High-capacity backward compatible floppy technologies became popular for a while and were sold as an option or even included in standard PCs, but in the long run, their use was limited to professionals and enthusiasts. Flash-based USB-thumb drives finally were a practical and popular replacement, that supported traditional file systems and all common usage scenarios of floppy disks. As opposed to other solutions, no new drive type or special software was required that impeded adoption, since all that was necessary was an already common USB-port. By 2002, most manufacturers still provided floppy disk drives as standard equipment to meet user demand for file-transfer and an emergency boot device, as well as for the general secure feeling of having the familiar device. By this time, the retail cost of a floppy drive had fallen to around $20, so there was little financial incentive to omit the device from a system. Subsequently, enabled by the widespread support for USB flash drives and BIOS boot, manufacturers and retailers progressively reduced the availability of floppy disk drives as standard equipment. In February 2003, Dell, a leading computer company at the time, announced that floppy drives would no longer be pre-installed on Dell Dimension home computers, although they were still available as a selectable option and purchasable as an aftermarket OEM add-on. As of January 2007, only 2% of computers sold in stores contained built-in floppy disk drives. Floppy disks are used for emergency boots in aging systems lacking support for other bootable media and for BIOS updates, since most BIOS and firmware programs can still be executed from bootable floppy disks. If BIOS updates fail or become corrupt, floppy drives can sometimes be used to perform a recovery. The music and theatre industries still use equipment requiring standard floppy disks (e.g. synthesizers, samplers, drum machines, sequencers, and lighting consoles). Industrial automation equipment such as programmable machinery and industrial robots may not have a USB interface; data and programs are then loaded from disks, damageable in industrial environments. This equipment may not be replaced due to cost or requirement for continuous availability; existing software emulation and virtualization do not solve this problem because a customized operating system is used that has no drivers for USB devices. Hardware floppy disk emulators can be made to interface floppy-disk controllers to a USB port that can be used for flash drives. In May 2016, the United States Government Accountability Office released a report that covered the need to upgrade or replace legacy computer systems within federal agencies. According to this document, old IBM Series/1 minicomputers running on 8-inch floppy disks are still used to coordinate "the operational functions of the United States' nuclear forces". The government planned to update some of the technology by the end of the 2017 fiscal year. Windows 10 no longer includes a generic driver for external (USB) floppy drives. For more than two decades, the floppy disk was the primary external writable storage device used. Most computing environments before the 1990s were non-networked, and floppy disks were the primary means of transferring data between computers, a method known informally as sneakernet. Unlike hard disks, floppy disks are handled and seen; even a novice user can identify a floppy disk. Because of these factors, a picture of a ​3 1⁄2-inch floppy disk has become an interface metaphor for saving data. The floppy disk symbol is still used by software on user-interface elements related to saving files, such as the release of Microsoft Office 2016, even though the physical floppy disks are largely obsolete. Disk notcher converts single-sided ​5 1⁄4-inch diskettes to double-sided. The 8-inch and ​5 1⁄4-inch floppy disks contain a magnetically coated round plastic medium with a large circular hole in the center for a drive's spindle. The medium is contained in a square plastic cover that has a small oblong opening in both sides to allow the drive's heads to read and write data and a large hole in the center to allow the magnetic medium to spin by rotating it from its middle hole. Inside the cover are two layers of fabric with the magnetic medium sandwiched in the middle. The fabric is designed to reduce friction between the medium and the outer cover, and catch particles of debris abraded off the disk to keep them from accumulating on the heads. The cover is usually a one-part sheet, double-folded with flaps glued or spot-welded together. A small notch disk identifies that it is writable, detected by a mechanical switch or phototransistor above it; if it is not present, the disk can be written; in the 8-inch disk the notch is covered to enable writing while in the ​5 1⁄4-inch disk the notch is open to enable writing. Tape may be used over the notch to change the mode of the disk. Punch devices were sold to convert read-only disks to writable ones and enable writing on the unused side of single sided disks; such modified disks became known as flippy disks. Another LED/photo-transistor pair located near the center of the disk detects the index hole once per rotation in the magnetic disk; it is used to detect the angular start of each track and whether or not the disk is rotating at the correct speed. Early 8‑inch and ​5 1⁄4‑inch disks had physical holes for each sector and were termed hard sectored disks. Later soft-sectored disks have only one index hole, and sector position is determined by the disk controller or low-level software from patterns marking the start of a sector. Generally, the same drives are used to read and write both types of disks, with only the disks and controllers differing. Some operating systems utilizing soft sectors, such as Apple DOS, do not use the index hole, and the drives designed for such systems often lack the corresponding sensor; this was mainly a hardware cost-saving measure. Two holes at the bottom left and right indicate whether the disk is write-protected and whether it is high-density; these holes are spaced as far apart as the holes in punched A4 paper, allowing write-protected high-density floppies to be clipped into standard ring binders. The dimensions of the disk shell are not quite square: its width is slightly less than its depth, so that it is impossible to insert the disk into a drive slot sideways (i.e. rotated 90 degrees from the correct shutter-first orientation). A diagonal notch at top right ensures that the disk is inserted into the drive in the correct orientation—not upside down or label-end first—and an arrow at top left indicates direction of insertion. The drive usually has a button that when pressed ejects the disk with varying degrees of force, the discrepancy due to the ejection force provided by the spring of the shutter. In IBM PC compatibles, Commodores, Apple II/IIIs, and other non-Apple-Macintosh machines with standard floppy disk drives, a disk may be ejected manually at any time. The drive has a disk-change switch that detects when a disk is ejected or inserted. Failure of this mechanical switch is a common source of disk corruption if a disk is changed and the drive (and hence the operating system) fails to notice. A simple example of a good design is the ​3 1⁄2-inch magnetic diskette for computers, a small circle of floppy magnetic material encased in hard plastic. 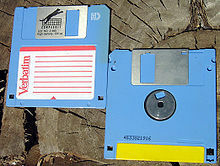 Earlier types of floppy disks did not have this plastic case, which protects the magnetic material from abuse and damage. A sliding metal cover protects the delicate magnetic surface when the diskette is not in use and automatically opens when the diskette is inserted into the computer. The diskette has a square shape: there are apparently eight possible ways to insert it into the machine, only one of which is correct. What happens if I do it wrong? I try inserting the disk sideways. Ah, the designer thought of that. A little study shows that the case really isn't square: it's rectangular, so you can't insert a longer side. I try backward. The diskette goes in only part of the way. Small protrusions, indentations, and cutouts, prevent the diskette from being inserted backward or upside down: of the eight ways one might try to insert the diskette, only one is correct, and only that one will fit. An excellent design. 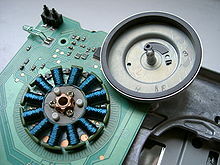 A spindle motor in the drive rotates the magnetic medium at a certain speed, while a stepper motor-operated mechanism moves the magnetic read/write heads radially along the surface of the disk. Both read and write operations require the media to be rotating and the head to contact the disk media, an action originally accomplished by a disk-load solenoid. Later drives held the heads out of contact until a front-panel lever was rotated (​5 1⁄4-inch) or disk insertion was complete (​3 1⁄2-inch). To write data, current is sent through a coil in the head as the media rotates. The head's magnetic field aligns the magnetization of the particles directly below the head on the media. When the current is reversed the magnetization aligns in the opposite direction, encoding one bit of data. To read data, the magnetization of the particles in the media induce a tiny voltage in the head coil as they pass under it. This small signal is amplified and sent to the floppy disk controller, which converts the streams of pulses from the media into data, checks it for errors, and sends it to the host computer system. A blank unformatted diskette has a coating of magnetic oxide with no magnetic order to the particles. During formatting, the magnetizations of the particles are aligned forming tracks, each broken up into sectors, enabling the controller to properly read and write data. The tracks are concentric rings around the center, with spaces between tracks where no data is written; gaps with padding bytes are provided between the sectors and at the end of the track to allow for slight speed variations in the disk drive, and to permit better interoperability with disk drives connected to other similar systems. Each sector of data has a header that identifies the sector location on the disk. A cyclic redundancy check (CRC) is written into the sector headers and at the end of the user data so that the disk controller can detect potential errors. Some errors are soft and can be resolved by automatically re-trying the read operation; other errors are permanent and the disk controller will signal a failure to the operating system if multiple attempts to read the data still fail. After a disk is inserted, a catch or lever at the front of the drive is manually lowered to prevent the disk from accidentally emerging, engage the spindle clamping hub, and in two-sided drives, engage the second read/write head with the media. In some ​5 1⁄4-inch drives, insertion of the disk compresses and locks an ejection spring which partially ejects the disk upon opening the catch or lever. This enables a smaller concave area for the thumb and fingers to grasp the disk during removal. Newer ​5 1⁄4-inch drives and all ​3 1⁄2-inch drives automatically engage the spindle and heads when a disk is inserted, doing the opposite with the press of the eject button. On Apple Macintosh computers with built-in floppy drives, the ejection button is replaced by software controlling an ejection motor which only does so when the operating system no longer needs to access the drive. The user could drag the image of the floppy drive to the trash can on the desktop to eject the disk. In the case of a power failure or drive malfunction, a loaded disk can be removed manually by inserting a straightened paper clip into a small hole at the drive's front panel, just as one would do with a CD-ROM drive in a similar situation. Before a disk can be accessed, the drive needs to synchronize its head position with the disk tracks. In some drives, this is accomplished with a Track Zero Sensor, while for others it involves the drive head striking an immobile reference surface. In either case, the head is moved so that it is approaching track zero position of the disk. When a drive with the sensor has reached track zero, the head stops moving immediately and is correctly aligned. For a drive without the sensor, the mechanism attempts to move the head the maximum possible number of positions needed to reach track zero, knowing that once this motion is complete, the head will be positioned over track zero. Some drive mechanisms such as the Apple II ​5 1⁄4-inch drive without a track zero sensor, produce characteristic mechanical noises when trying to move the heads past the reference surface. This physical striking is responsible for the ​5 1⁄4-inch drive clicking during the boot of an Apple II, and the loud rattles of its DOS and ProDOS when disk errors occurred and track zero synchronization was attempted. Different sizes of floppy disks are mechanically incompatible, and disks can fit only one size of drive. Drive assemblies with both ​3 1⁄2-inch and ​5 1⁄4-inch slots were available during the transition period between the sizes, but they contained two separate drive mechanisms. In addition, there are many subtle, usually software-driven incompatibilities between the two. ​5 1⁄4-inch disks formatted for use with Apple II computers would be unreadable and treated as unformatted on a Commodore. As computer platforms began to form, attempts were made at interchangeability. For example, the "SuperDrive" included from the Macintosh SE to the Power Macintosh G3 could read, write and format IBM PC format ​3 1⁄2-inch disks, but few IBM-compatible computers had drives that did the reverse. 8-inch, ​5 1⁄4-inch and ​3 1⁄2-inch drives were manufactured in a variety of sizes, most to fit standardized drive bays. Alongside the common disk sizes were non-classical sizes for specialized systems. The first floppy disk was 8 inches in diameter, was protected by a flexible plastic jacket and was a read-only device used by IBM as a way of loading microcode. Read/write floppy disks and their drives became available in 1972 but it was IBM's 1973 introduction of the 3740 data entry system that began the establishment of floppy disks, called by IBM the "Diskette 1", as an industry standard for information interchange. The formatted diskette for this system stored 242,944 bytes. Early microcomputers used for engineering, business, or word processing often used one or more 8-inch disk drives for removable storage; the CP/M operating system was developed for microcomputers with 8-inch drives. The family of 8-inch disks and drives increased over time and later versions could store up to 1.2 MB; many microcomputer applications did not need that much capacity on one disk, so a smaller size disk with lower-cost media and drives was feasible. The ​5 1⁄4-inch drive succeeded the 8-inch size in many applications, and developed to about the same storage capacity as the original 8-inch size, using higher-density media and recording techniques. Uncovered ​5 1⁄4‑inch disk mechanism with disk inserted. 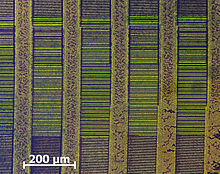 The head gap of an 80‑track high-density (1.2 MB in the MFM format) ​5 1⁄4‑inch drive (a.k.a. Mini diskette, Mini disk, or Minifloppy) is smaller than that of a 40‑track double-density (360 KB) drive but can format, read and write 40‑track disks well provided the controller supports double stepping or has a switch to do such a process. ​5 1⁄4-inch 80-track drives were also called hyper drives. [nb 2] A blank 40‑track disk formatted and written on an 80‑track drive can be taken to its native drive without problems, and a disk formatted on a 40‑track drive can be used on an 80‑track drive. Disks written on a 40‑track drive and then updated on an 80 track drive become unreadable on any 40‑track drives due to track width incompatibility. Single sided disks were coated on both sides, despite the availability of more expensive double sided disks. The reason usually given for the higher cost was that double sided disks were certified error-free on both sides of the media. Double-sided disks could be used in some drives for single-sided disks, as long as an index signal was not needed. This was done one side at a time, by turning them over (flippy disks); more expensive dual-head drives which could read both sides without turning over were later produced, and eventually became used universally. Internal parts of a ​3 1⁄2‑inch floppy disk. 1) A hole that indicates a high-capacity disk. 2) The hub that engages with the drive motor. 3) A shutter that protects the surface when removed from the drive. 5) A polyester sheet reducing friction against the disk media as it rotates within the housing. 6) The magnetic coated plastic disk. 7) A schematic representation of one sector of data on the disk; the tracks and sectors are not visible on actual disks. 8) The write protection tab (unlabeled) in upper left. A ​3 1⁄2-inch floppy disk drive. In the early 1980s, a number of manufacturers introduced smaller floppy drives and media in various formats. A consortium of 21 companies eventually settled on a ​3 1⁄2-inch floppy disk (actually 90 mm wide) a.k.a. Micro diskette, Micro disk, or Micro floppy, similar to a Sony design but improved to support both single-sided and double-sided media, with formatted capacities generally of 360 KB and 720 KB respectively. Single-sided drives shipped in 1983, and double sided in 1984. What became the most common format, the double-sided, high-density (HD) 1.44 MB disk drive, shipped in 1986. The first Macintosh computers use single-sided ​3 1⁄2-inch floppy disks, but with 400 KB formatted capacity. These were followed in 1986 by double-sided 800 KB floppies. The higher capacity was achieved at the same recording density by varying the disk rotation speed with head position so that the linear speed of the disk was closer to constant. Later Macs could also read and write 1.44 MB HD disks in PC format with fixed rotation speed. All ​3 1⁄2-inch disks have a rectangular hole in one corner which, if obstructed, write-enabled the disk. A sliding detented piece can be moved to block or reveal the part of the rectangular hole that is sensed by the drive. The HD 1.44 MB disks have a second, unobstructed hole in the opposite corner which identifies them as being of that capacity. In IBM-compatible PCs, the three densities of ​3 1⁄2-inch floppy disks are backwards-compatible: higher density drives can read, write and format lower density media. It is also possible to format a disk at a lower density than it was intended for, but only if the disk is first thoroughly demagnetized with a bulk eraser, as the high density format is magnetically stronger and will prevent the disk from working in lower density modes. Writing at different densities than disks were intended for, sometimes by altering or drilling holes, was possible but deprecated. The holes on the right side of a ​3 1⁄2‑inch disk can be altered as to make some disk drives and operating systems treat the disk as one of higher or lower density, for bidirectional compatibility or economical reasons. [clarification needed] Some computers, such as the PS/2 and Acorn Archimedes, ignored these holes altogether. It is possible to make a ​3 1⁄2-inch floppy disk drive be recognized by a system as a ​5 1⁄4‑inch 360 KB or 1200 KB drive, and to read and write disks with the same number of tracks and sectors as those disks; this had some application in data exchange with obsolete CP/M systems. Other, smaller, floppy sizes were proposed, especially for portable or pocket-sized devices that needed a smaller storage device. 3-inch disks similar in construction to ​3 1⁄2-inch were manufactured and used for a time, particularly by Amstrad computers and word processors. A 2-inch nominal size known as the Video Floppy was introduced by Sony for use with its Mavica still video camera. An incompatible 2-inch floppy was produced by Fujifilm called the LT-1 was used in the Zenith Minisport portable computer. Neither of these sizes achieved much market success. Floppy disk size is often referred to in inches, even in countries using metric and though the size is defined in metric. 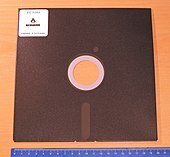 The ANSI specification of ​3 1⁄2-inch disks is entitled in part "90 mm (3.5 inch)" though 90 mm is closer to 3.54 inches. Formatted capacities are generally set in terms of kilobytes and megabytes. ​5 1⁄4-inch Apple Disk II (Roland Gustafsson's RWTS18) 1988 157.5 KB (768 byte sectors, 6 sectors/track, 35 tracks) Game publishers privately contracted 3rd party custom DOS. 3-inch DD ? ? ? 3-inch Mitsumi Quick Disk 1985 128 to 256 KB ? 2-inch 1989 720 KB ? ​5 1⁄4-inch[not in citation given] Perpendicular 1986 100 KB per inch ? For 8-inch see List of floppy disk formats#IBM 8-inch formats. Spare, hidden and otherwise reserved sectors are included in this number. For ​5 1⁄4- and ​3 1⁄2-inch capacities quoted are from subsystem or system vendor statements. Marketed capacity is the capacity, typically unformatted, by the original media OEM vendor or in the case of IBM media, the first OEM thereafter. Other formats may get more or less capacity from the same drives and disks. A box of about 80 floppy disks together with one USB memory stick. The stick is capable of holding over 130 times as much data as the entire box of disks put together. Data is generally written to floppy disks in sectors (angular blocks) and tracks (concentric rings at a constant radius). For example, the HD format of ​3 1⁄2-inch floppy disks uses 512 bytes per sector, 18 sectors per track, 80 tracks per side and two sides, for a total of 1,474,560 bytes per disk. Some disk controllers can vary these parameters at the user's request, increasing storage on the disk, although they may not be able to be read on machines with other controllers. For example, Microsoft applications were often distributed on ​3 1⁄2-inch 1.68 MB DMF disks formatted with 21 sectors instead of 18; they could still be recognized by a standard controller. On the IBM PC, MSX and most other microcomputer platforms, disks were written using a constant angular velocity (CAV) format, with the disk spinning at a constant speed and the sectors holding the same amount of information on each track regardless of radial location. Because the sectors have constant angular size, the 512 bytes in each sector are compressed more near the disk's center. A more space-efficient technique would be to increase the number of sectors per track toward the outer edge of the disk, from 18 to 30 for instance, thereby keeping nearly constant the amount of physical disk space used for storing each sector; an example is zone bit recording. Apple implemented this in early Macintosh computers by spinning the disk more slowly when the head was at the edge, while maintaining the data rate, allowing 400 KB of storage per side and an extra 80 KB on a double-sided disk. This higher capacity came with a disadvantage: the format used a unique drive mechanism and control circuitry, meaning that Mac disks could not be read on other computers. Apple eventually reverted to constant angular velocity on HD floppy disks with their later machines, still unique to Apple as they supported the older variable-speed formats. Disk formatting is usually done by a utility program supplied by the computer OS manufacturer; generally, it sets up a file storage directory system on the disk, and initializes its sectors and tracks. Areas of the disk unusable for storage due to flaws can be locked (marked as "bad sectors") so that the operating system does not attempt to use them. This was time consuming so many environments had quick formatting which skipped the error checking process. When floppy disks were often used, disks pre-formatted for popular computers were sold. The unformatted capacity of a floppy disk does not include the sector and track headings of a formatted disk; the difference in storage between them depends on the drive's application. Floppy disk drive and media manufacturers specify the unformatted capacity (for example, 2 MB for a standard ​3 1⁄2-inch HD floppy). It is implied that this should not be exceeded, since doing so will most likely result in performance problems. DMF was introduced permitting 1.68 MB to fit onto an otherwise standard ​3 1⁄2-inch disk; utilities then appeared allowing disks to be formatted as such. Mixtures of decimal prefixes and binary sector sizes require care to properly calculate total capacity. Whereas semiconductor memory naturally favors powers of two (size doubles each time an address pin is added to the integrated circuit), the capacity of a disk drive is the product of sector size, sectors per track, tracks per side and sides (which in hard disk drives with multiple platters can be greater than 2). Although other sector sizes have been known in the past, formatted sector sizes are now almost always set to powers of two (256 bytes, 512 bytes, etc. ), and, in some cases, disk capacity is calculated as multiples of the sector size rather than only in bytes, leading to a combination of decimal multiples of sectors and binary sector sizes. For example, 1.44 MB ​3 1⁄2-inch HD disks have the "M" prefix peculiar to their context, coming from their capacity of 2,880 512-byte sectors (1,440 KiB), consistent with neither a decimal megabyte nor a binary mebibyte (MiB). Hence, these disks hold 1.47 MB or 1.41 MiB. Usable data capacity is a function of the disk format used, which in turn is determined by the FDD controller and its settings. Differences between such formats can result in capacities ranging from approximately 1300 to 1760 KiB (1.80 MB) on a standard ​3 1⁄2-inch high-density floppy (and up to nearly 2 MB with utilities such as 2M/2MGUI). The highest capacity techniques require much tighter matching of drive head geometry between drives, something not always possible and unreliable. For example, the LS-240 drive supports a 32 MB capacity on standard ​3 1⁄2-inch HD disks, but it is, however, a write-once technique, and requires its own drive. The raw maximum transfer rate of ​3 1⁄2-inch ED floppy drives (2.88 MB) is nominally 1,000 kilobits/s, or approximately 83% that of single-speed CD‑ROM (71% of audio CD). This represents the speed of raw data bits moving under the read head; however, the effective speed is somewhat less due to space used for headers, gaps and other format fields and can be even further reduced by delays to seek between tracks. ^ The cost of a hard disk with a controller in the mid 1980s was thousands of dollars, for capacity of 80 MB or less. ^ "Hyper drive" was an alternative name for ​5 1⁄4-inch 80-track HD floppy drives with 1.2 MB capacity. The term was used f.e. by Philips Austria for their Philips :YES and Digital Research in conjunction with DOS Plus. ^ a b c Teja, Edward R. (1985). The Designer's Guide to Disk Drives (1st ed.). Reston, Virginia, USA: Reston Publishing Company, Inc. / Prentice-Hall Company. ISBN 0-8359-1268-X. ^ a b Fletcher, Richard (2007-01-30). "PC World announces the end of the floppy disk". The Daily Telegraph. Retrieved 2011-06-22. ^ "1971: Floppy disk loads mainframe computer data". Computer History Museum. Computer History Museum. Retrieved 2015-12-01. ^ "Five decades of disk drive industry firsts". www.disktrend.com (web.archive.org). Archived from the original on 2011-07-26. Retrieved 2012-10-15. ^ Watson (2010-05-24). "The Floppy Disk". Canadian Business. 83 (8): 17. ^ Reinhardt, Andy (1996-08-12). "Iomega's zip drives need a bit more zip". Business Week. The McGraw-Hill Companies (33). ISSN 0007-7135. Archived from the original on 2008-07-06. ^ "floppy". LinuxCommand.org. 2006-01-04. Archived from the original on 2011-07-27. Retrieved 2011-06-22. ^ Spring, Tom (2002-07-24). "What Has Your Floppy Drive Done for You Lately? PC makers are still standing by floppy drives despite vanishing consumer demand". PC World. Archived from the original on 2011-12-24. Retrieved 2012-04-04. ^ "R.I.P. Floppy Disk". BBC News. 2003-04-01. Retrieved 2011-07-19. ^ Derbyshire, David (2007-01-30). "Floppy disks ejected as demand slumps". The Daily Telegraph. Retrieved 2011-07-19. ^ "Federal Agencies Need to Address Aging Legacy Systems" (PDF). Report to Congressional Requesters. United States Government Accountability Office. May 2016. Retrieved 2016-05-26. ^ Trujillo, Mario (2016-05-25). "US nuclear emergency messaging system still uses floppy disks". The Hill. Retrieved 2016-05-30. ^ "Microsoft Lists Features You'll Lose When Upgrading to Windows 10". NDTV Gadgets. New Delhi Television Limited. 2015-06-02. Retrieved 2015-06-03. ^ "Here Are the Features Windows 10 Will Remove When You Upgrade - Thurrott.com". Thurrott.com. 2015-06-01. Retrieved 2017-11-20. ^ Landphair, Ted (2007-03-10). "So Long, Faithful Floppies". VOA News. Voice of America. Retrieved 2008-12-25. ^ "The Disk II". Apple II History. Retrieved 2018-02-17. Wozniak’s technique would allow the drive to do self-synchronization (“soft sectoring”), not have to deal with that little timing hole, and save on hardware. ^ (M)Tronics SCS (2007-05-20). "Floppy-Disketten-Laufwerke" [Floppy disk drives] (in German). Archived from the original on 2017-06-19. Retrieved 2017-06-19. ^ Norman, Donald (1990). "Chapter 1". The Design of Everyday Things. New York, USA: Doubleday. ISBN 0-385-26774-6. ^ Porter, Jim, ed. (2005). "Oral History Panel on 8 inch Floppy Disk Drives" (PDF). p. 4. Archived from the original (PDF) on 2010-07-07. Retrieved 2011-06-22. ^ "Floppy Disk". Louisiana State University. ^ "IBM Archives: IBM 3740". www-03.ibm.com. 23 January 2003. ^ IBM 3740 Data Entry System System Summary and Installation Manual -Physical Planning (PDF). IBM. 1974. p. 2. The diskette is about 8" (20 cm) square and has a net capacity of 1898 128-character records -about one day's data entry activity. Each of the diskette's 73 magnetic recording tracks available for data entry can hold 26 sectors of up to 128 characters each. ^ "The IBM Diskette General Information Manual". ^ Shea, Tom (1983-06-13). "Shrinking drives increase storage". InfoWorld: 1, 7, 8, 9, 11. Shugart is one of the major subscribers to the 3-1/2-inch micro-floppy standard, along with Sony and 20 other company... Its single-sided SA300 micro-floppy drive offers 500K of unformatted storage. Shugart's Kevin Burr said the obvious next step is to put another 500K of storage on the other side of the diskette and that the firm will come out with a double-sided 1-megabyte micro-floppy drive soon. ^ "Managing Disks". Retrieved 2006-05-25. ^ "A question of floppies". Retrieved 2011-02-20. ^ "Formatting 720K Disks on a 1.44MB Floppy". Floppy Drive. Retrieved 2011-02-11. ^ "Sony / Canon 2 Inch Video Floppy". Museum of Obsolete Media. Retrieved 4 January 2018. ^ "2 inch lt1 floppy disk". Museum of Obsolete Media. Retrieved 4 January 2018. ^ ANSI X3.137, One- and Two-Sided, Unformatted, 90-mm (3.5-inch) 5,3-tpmm (135-tpi), Flexible Disk Cartridge for 7958 bpr Use. General, Physical and Magnetic Requirements. ^ a b c Engh, James T. (September 1981). "The IBM Diskette and Diskette Drive". IBM Journal of Research and Development: 701–10. ^ a b "Memorex 650 Flexible Disc File" (PDF). Retrieved 2011-06-22. ^ Sollman, George (July 1978). "Evolution of the Minifloppy Product Family". IEEE Transactions on Magnetics. 14 (4): 160–66. doi:10.1109/TMAG.1978.1059748. ISSN 0018-9464. ^ "Shugart SA 400 Datasheet". Swtpc. 2007-06-25. Retrieved 2011-06-22. ^ Beals, Gene (n.d.). "New Commodore Products: A Quick Review" (PDF). PET User Notes. Vol. 2 no. 1. Montgomeryville, Pennsylvania. p. 2. Retrieved 2018-10-07. ^ a b West, Raeto Collin (January 1982). Programming the PET/CBM: The Reference Encyclopedia For Commodore PET & CBM Users. COMPUTE! Books. p. 167. ISBN 0-942386-04-3. Retrieved 2018-10-07. ^ Commodore Business Machines (1980-02-05). "cbmsrc / DOS_4040 / dos". Retrieved 2018-10-07. ^ "Chronology of Events in the History of Microcomputers − 1981–1983 Business Takes Over". Retrieved 2008-10-04. ^ a b "Three-inch floppy disk product announced" (PDF). Archived from the original (PDF) on August 8, 2012. Retrieved 2008-10-04. ^ Infoworld Media Group (1982-11-01). "Tandon announces tiny but powerful ​3 1⁄2 inch disk drive". InfoWorld. InfoWorld Media Group, Inc. 4 (43): 11. ISSN 0199-6649. ^ "Viability of 2-Inch Media Standard for PCs in Doubt". InfoWorld. 11 (31): 21. 1989-07-31. ^ a b c d "Model CE-1600F". Sharp PC-1600 Service Manual (PDF). Yamatokoriyama, Japan: Sharp Corporation, Information Systems Group, Quality & Reliability Control Center. July 1986. pp. 98–104. Archived (PDF) from the original on 2017-03-23. Retrieved 2017-03-12. ^ a b c d Sharp Service Manual Model CE-140F Pocket Disk Drive (PDF). Sharp Corporation. 00ZCE140F/SME. Archived (PDF) from the original on 2017-03-11. Retrieved 2017-03-11. ^ a b c Bateman, Selby (March 1986). "The Future of Mass Storage". COMPUTE!. No. 70. COMPUTE! Publications, Inc. p. 18. Retrieved 2018-10-07. ^ a b Mueller, Scott (2004). Upgrading and Repairing PCs, 15th Anniversary Edition. Que Publishing. p. 1380. ISBN 0-7897-2974-1. Retrieved 2011-07-16. ^ Mueller, Scott (1994). Hardware-Praxis – PCs warten reparieren, aufrüsten und konfigurieren (in German) (3rd ed.). Addison-Wesley Publishing Company. p. 441. ISBN 3-89319-705-2. ^ Inc, InfoWorld Media Group (14 October 1991). "InfoWorld". InfoWorld Media Group, Inc. – via Google Books. ^ Shah, Katen A. (1996) [September 1992, April 1992]. Intel 82077SL for Super-Dense Floppies (PDF) (Application Note) (2 ed.). Intel Corporation, IMD Marketing. AP-358, 292093-002. Archived (PDF) from the original on 2017-06-19. Retrieved 2017-06-19. ^ Inc, Ziff Davis (10 September 1991). "PC Mag". Ziff Davis, Inc. – via Google Books. ^ Inc, InfoWorld Media Group (19 March 1990). "InfoWorld". InfoWorld Media Group, Inc. – via Google Books. ^ "Chapter 8: Floppy Disk Drives" (PDF). Retrieved 2011-07-16. ^ "PROPERTIES OF STORAGE SYSTEMS". Mt. San Antonio College. Archived from the original on 2013-12-07. Weyhrich, Steven (2005). "The Disk II": A detailed essay describing one of the first commercial floppy disk drives (from the Apple II History website). Immers, Richard; Neufeld, Gerald G. (1984). Inside Commodore DOS • The Complete Guide to the 1541 Disk Operating System. DATAMOST & Reston Publishing Company (Prentice-Hall). ISBN 0-8359-3091-2. Englisch, Lothar; Szczepanowski, Norbert (1984). The Anatomy of the 1541 Disk Drive. Grand Rapids, Michigan, USA, Abacus Software (translated from the original 1983 German edition, Düsseldorf, Data Becker GmbH). ISBN 0-916439-01-1. Hewlett Packard: 9121D/S Disc Memory Operator's Manual; printed 1 September 1982; part number 09121-90000. Wikimedia Commons has media related to Floppy disk.